Much of Palestine's/Israel's appeal to tourists stems from it constituting the claimed historical site of many of the stories of the holy scriptures and tourists come in flocks to see the numerous excavation sites, many of which seem to confirm the narrative of the bible. But can the material remains that archaeologists have discovered, interpreted, selected and arranged in front of us, always be taken as representing one objective truth? Hardly. 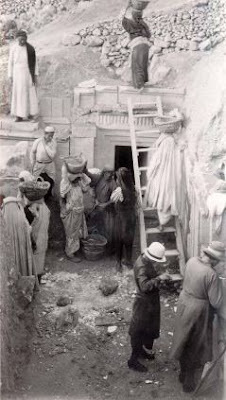 Like many other disciplines, archaeology is often cloaked behind a facade of empirical objectivity, but like those other disciplines, also archaeology should be regarded as "a process influenced by the aims of its practitioners, who are, in turn, deeply affected by contemporary intellectual, social and political agendas." Like anthropology and other related disciplines, archaeology is a child of European colonialism. Rather than focussing on the past of "native" and "recent" cultures, Western archaeologists typically devoted a larger share of attention to those discoveries which seemed to be ancestral to Europe. In the process, local people living in the surroundings of excavation sites, were commonly seen as divorced from the ancient past, and treated as chaep labour, or as obstacles to the research and were in many cases expelled from their homes. With a critical turn in the field, archaeologists started questioning previous excavations, highlighting the subjective interests/perspectives of the scholars, as well as the political contexts in which archaeological research had been conducted. Especially within the context of ethnic or national conflicts which frequently involve contentious territorial and proprietary claims which are based on the ancient past, archaeologists helped underwriting specific agendas by utilizing material remains to narrate a specific history. In Nazi Germany for instance German archaeologists set out to Eastern Europe in order to find Germanic sites, which would demonstrate Aryan racial superiority and justify the expansion of the Third Reich to include all of "ancient Germany". So although archaeologists most likely did not directly participate in the Nazi crimes they did contribute to the legitimacy of the regime, and were thus accomplices in the inhumane acts of the regime. 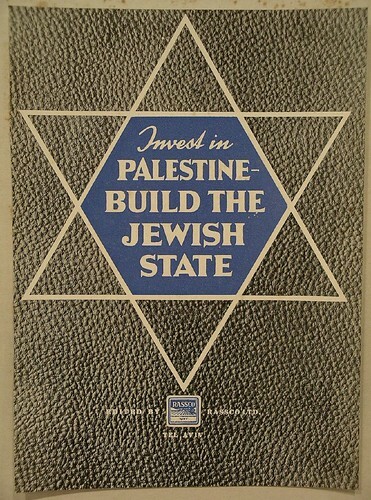 Zionism, although originally a secular movement, to a large extent rests on the claimed historical Jewish right to Palestine, as described in the bible, and the work of many Israeli archaeologists has been focussed on affirming those biblical and Zionist narratives through their discoveries. From the 1970s onwards however, a new breed of Israeli archaeologists emerged, who, similar to the "New Historians", who started questioning Zionist historical narratives, stopped treating the bible as “the unquestioned narrative framework into which every archaeological find must be fit“. 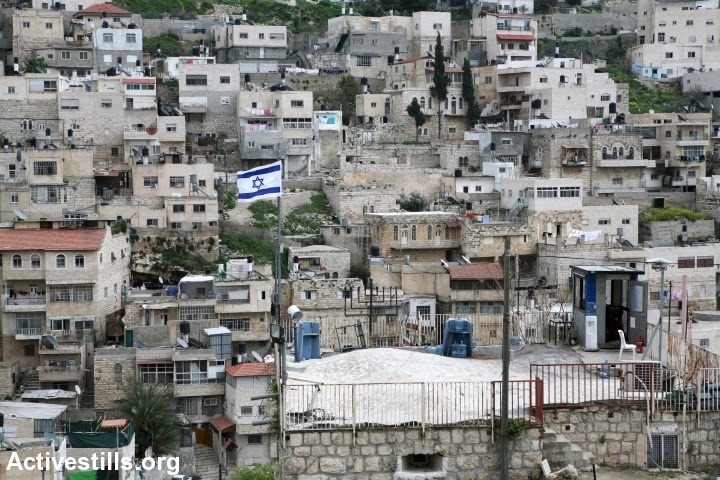 Silwan is a Palestinian village south-east of Jerusalem's Old City. The location of the village has been long referred to by archaeologists and biblical scholars as the oldest part of Jerusalem and the site of the City of David, where David built his palace and established his capital. Ever since the first excavations were conducted in Silwan in 1867 by the Palestine Exploration Fund, “the modern village has literally grown up around archaeological sites“. The discoveries from the area have been indeed very rich, but rather than exclusively supporting the biblical narrative, they resemble an "archaeological mishmash", which shows that "for 5,000 years Jerusalemites have dismantled ancient structures, turned over graves, and excavated down to the bedrock to re-cycle the worked stones of their ancestors". However, rather than exhibiting a multilayered site, which would in fact tell the story of the various cultures comprising the city's past and present, archaeologists by and large focus on the Israeli angle of the narrative. Yet not all findings easily underwrites this narrative and some discoveries in Silwan have indeed stirred controversies among archaeologists and biblical scholars. In 1998 a massive city wall was found, which dated roughly to 1500 BCE, i.e. 500 years before David's takeover of the city, and thus supported a rival theory of the existence of a large scale urban centre pre-existing David and Solomon. 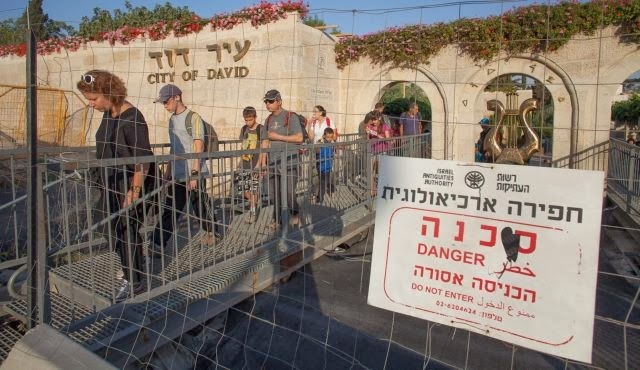 In 1995 the City of David Archaeological Park was founded, which fuelled the process of an Israeli reclamation of the village of Silwan and the concomitant expulsion and dispossession of its Palestinian residents. According to Israel‘s Law of Antiquities, all building sites need first to be checked for archaeological remains, and consequently, construction of settler homes and tourist infrastructure have prompted even more excavations throughout the valley. Since 1997 the park has been operated by the right-wing settler foundation Ir David (ELAD). This organisation “funds numerous state-run archaeological excavations and brings hundreds of thousands of people to the Holy Basin each year.” Apart from clearly selecting and manipulating the discoveries in order to narrate the contested biblical story of David's takeover of the Jebusite City, the very practice of archaeology in Silwan has contributed to a physical reshaping of the village, as well as paving the legal path for Jewish settlement expansion. Many of the archaeologists at work are reportedly aware of, and opposed to the destructive force of settlement activities, as well as the consequences they have for the Palestinian residents, but instead of speaking up, they simply proclaim an objective distance from ideological conflicts, and thus overlook their complicity in turning a living Palestinian village into a fabricated place called "City of David". 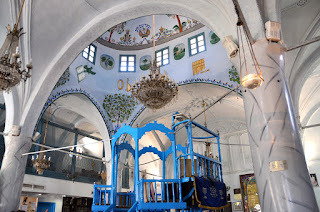 Green Olive Tours organises weekly tours to Silwan and the City of David which deal with the sensitive and controversial issues affecting the lives of people in Silwan.